Evening Clicker Obedience is held on Tuesdays @ 7:00 p.m. For information about the next scheduled session, contact Nancy Strack at nestrack@yahoo.com. Daytime Clicker Obedience is held on Wednesday mornings (time dependent on weather). For more information about the next scheduled session, contact Hannelore Orkis at gtofan@aol.com. A Puppy Agility Class will be scheduled as soon as at least 5 pups are signed up to attend. Classes are usually held on Wednesdays at 6:45 p.m. For more information, contact Debbie at debbie@pawsagility.com. 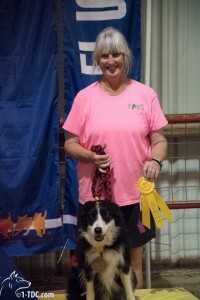 Evening Beginners Agility Class (Level 1) is held on Mondays 6:45 p.m. Contact Debbie at debbie@pawsagility.com for more information. What a year 2017 was for me and my 4-legged boys! With no plans to attend AKC Nationals in Reno, Nevada in March 2018 (because of the long distance), my first unbelievable surprise was that Braedan completed the qualifications to enter the competition in just the first three regular trials he ran in at the beginning of the year. Nationals in 2019 will be back in Tulsa, so we’ll plan on making that trip. Because I did want to attend Cynosport (USDAA Nationals) in Tennessee in October, I focused on USDAA trials during the year. Before making the trip, we competed in two Regional competitions – one in Kerrville in April and the other in Gardner, Kansas, in August. I still consider Ryker a young dog (he turns 4 years old in March 2018), so I was thrilled when he got a 2nd Place in Team Gamblers and earned a Steeplechase Semifinals Bye, finishing in 7th Place out of at least 25 dogs in his jump height. Braedan had an awesome Regional, earning a place on the podium three times! 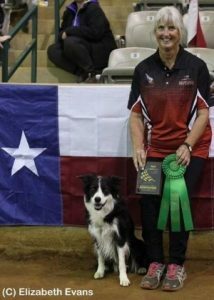 He finished in 3rd Place in the Masters Challenge Biathlon, his team took 2nd Place in the Dog Agility Masters Team Tournament, and – most exciting – he won the Grand Prix, earning him the title of South Central Regional Grand Prix Champion! The Regional in Kansas was next. Ryker pulled out a second Grand Prix Q, enabling him to run in that class at Cynosport. He also took a 3rd Place in Team Gamblers (out of about 58 dogs in his jump height) and got a second Steeplechase Semifinals Bye. Braedan started off the weekend by getting on the podium with a 2nd Place in Masters Challenge Biathlon! He also placed 2nd in Team Gamblers (his baby brother, Ryker, taking 3rd as mentioned above). Finishing off the weekend, Braedan’s team – Kiss My Sass – took the podium with a 1st Place in the Team Tournament, making them the USDAA Central Regional Team Champions! Finally it was time for Cynosport. This major event – with competitors from all over the United States, as well as many other countries – ran from October 25th through the 29th. Braedan’s first major class was the Steeplechase Quarterfinals (he hadn’t earned a Semifinals Bye in either of the two Regionals, so he had to start at this level). As I was watching other handler & dog teams run the course, I realized I’d forgotten my walk-through, so I had to memorize the course from the sidelines and from the course map and hope for the best. Braedan ran clean with just a slight bobble (he wanted to go to an off-course tunnel) that required a major call-off. The cutoff to make it to the Semifinals was a little over 32 seconds, and Braedan ran it in 30.19. Both Ryker & Braedan had fantastic Team Gamblers runs, although Ryker missed a weave entry, which cost us some points. 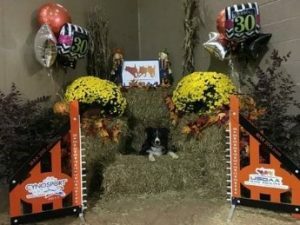 Out of 207 dogs running in the 22″ class, Braedan ended up in 6th Place. dog mom! Although our Steeplechase Finals run included a couple handler-induced bobbles, I was so proud of how Ryker ran. In a class of about 87 dogs in Braedan’s jump height for the Grand Prix Semifinals course, I was happy with Braedan’s run. It felt good and was smooth. At close to 8 years of age, I wasn’t sure our time would be fast enough to make the cut to Finals because I saw a few dogs run it a couple seconds faster than us. I didn’t want to watch the monitor to see where we stood – I was just going to wait until it was all done. Final results weren’t posted until the end of the day, but it was worth the excruciating wait when I saw that Braedan got the very last spot (#20) and therefore would get to run in the Finals on Sunday afternoon. Place (out of 160+ teams). By the end of the second day, we’d moved up to 27th Place. That was already good enough to be able to run in the Team Relay (only the top 30 teams get to run), but we managed to move up to 15th Place by that time. The Team Relay was held late Saturday afternoon. 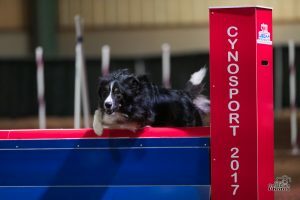 One of our teammates fell at the third jump and, although she tried hard to save it, her dog came to her, so it caused a refusal (2 faults) and time. Still, though, we ran hard and finished up in 11th Place overall. The Grand Prix Finals were held on Saturday night. 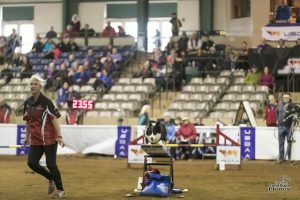 Dog & handler teams were seeded based on how they finished in the Semifinals, so Braedan had to run first in his 22″ jump height. A slight miscommunication early in the course caused me to have to change a handling decision I’d made during the walk-through, but we still managed to run the course clean. 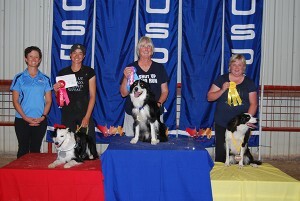 Several of my Texas agility friends came down from the stands to congratulate me and give me a hug for a job well done. After our run, I was too nervous to watch any of the other 22” dogs run (there were 19 more to go), so Braedan & I walked around the arena. Since everyone who runs in the Finals gets a rosette, I knew I had to stay for that. 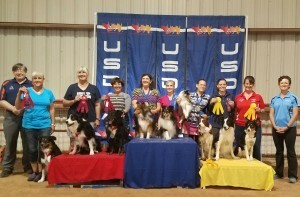 As I waited for our names to be called, I couldn’t believe they called the first 10 dogs and were then calling placements from 10th to 1st Place. My best boy Braedan finished in 6th Place!!! Not bad for starting in the #20 spot in this run and finishing ahead of so many other great handlers. USDAA Regionals and Nationals always motivate me to go home and work even harder for the following year’s events, and I’ll be doing just that. Cynosport in 2018 will be held in Scottsdale, Arizona, and I’ll be there. Finishing up 2017, I welcomed a new addition to the Spence menagerie. Kelby is a Sheltie who was born on September 22, 2017. I picked him up over Thanksgiving weekend, and he’s already starting his agility foundation training. Since my previous two Shelties came to me as adults (rehomes), I’m excited to see what I can do with this little boy in the years to come.